Brides throughout Jupiter Florida choose use for elegant, romantic and timeless wedding photography. Couture Bridal Photography is Jupiter Florida's number one (#1) wedding photographer for the most elegant, romantic and timeless artistic wedding day photography. Couture Bridal Photography is Jupiter Florida's Premiere Wedding Photography studio based in Fort Lauderdale, Florida. We are internationally recognized as the top wedding photography studio in Florida and ranked in the top 20 in the united States. Couture Bridal Photography offers the most comprehensive wedding photography throughout Jupiter, Hobe Sound, Jupiter Island, Palm Beach Gardens, Riviera Beach, Town of Palm Beach and anywhere in Florida. Couture Bridal Photography is also known as the most preferred destination wedding photography studio for the most stunning wedding photography images. 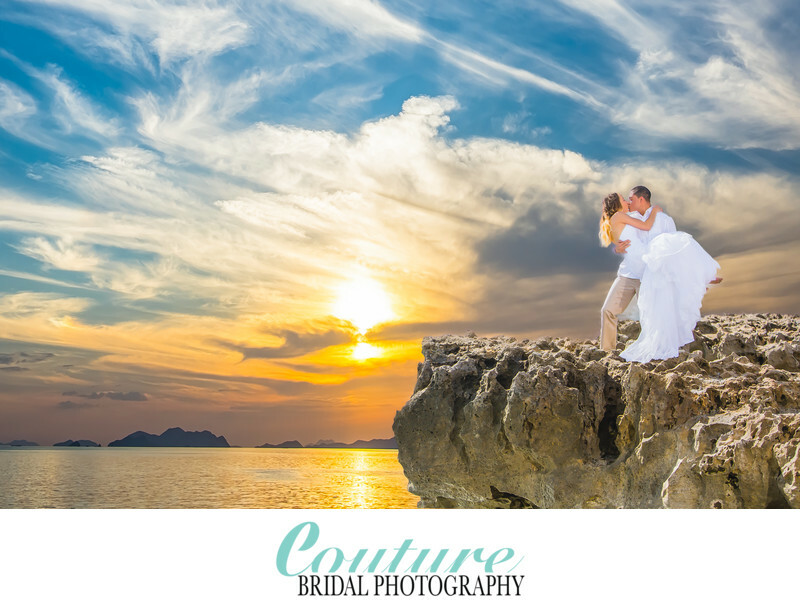 Couture Bridal Photography is a boutique luxury wedding photography studio with the number one team of artistic wedding photographers and assistants. Couture Bridal Photography also offers professional printing and wedding photo art books exclusively by GraphiStudio. Couture Bridal Photography offers amazing wedding photography portraits on a couples wedding day to become heirloom wedding pictures to be shared for a life time. The bride in this image was Victoria, who recently married and requested the best wedding photography in Jupiter Florida. During her cocktail hour we drove quickly to the Blowing Rocks Preserve to create the most artistic wedding portrait images imaginable. The Bride posed and we captured several images during a short period of time prior to returning to the Brides Jupiter Beach Resort Wedding Reception. Call and book the best Jupiter Florida Wedding Photography for the best wedding day photography and experience! Location: 574 S Beach Rd, Hobe Sound, FL 33455. Keywords: Blowing Rocks Preserve (3), Bridal Portrait (120), Jupiter Beach Resort (6), Palm Beach (114). 1/1250; f/3.2; ISO 100; 70.0 mm.